To plan my color palette for a new pastel painting, I began testing colors of various pastel sticks on a strip of Uart 400 sanded pastel paper. It seemed like a natural approach to interpret a narrow strip from the reference photo. Later, I realized that testing the exposure in a narrow strip was a method that I used in black and white darkroom photography many years ago. It also seemed to translate into planning a pastel painting. The reference photo was captured on the north shore of Lake Tahoe one October evening just after the sun had slipped behind the mountains. 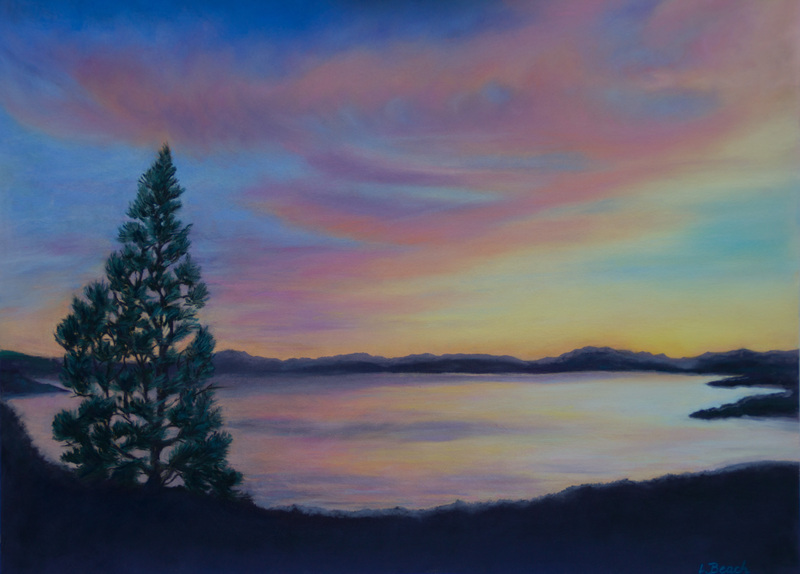 My challenge in this painting will be to capture the afterglow in the sky and the reflected color on the lake. I plan to emphasize the landscape format using non standard dimensions. I will post more on the painting when it is complete. Technical Notes: Pastel brands – NuPastel, Rembrandt, Sennelier, Schminke, Terri Ludwig. Uart 400 Pastel Paper.